Clare Flynn Levy talks to Annie Duke about the similarities in decision-making approach found between professional poker players and investors. This post contains affiliate links to Amazon and we get a very small commission for any purchase you make. For two decades, Annie Duke was one of the top poker players in the world. She is a World Series of Poker bracelet winner, the winner of the 2004 Tournament of Champions and the only woman to win the NBC National Poker Heads Up Championship. Prior to becoming a professional poker player, Annie was awarded a National Science Foundation Fellowship to study Cognitive Psychology at the University of Pennsylvania. She now spends her time writing, coaching, and speaking on a range of topics such as decision fitness, emotional control, and embracing uncertainty. Clare Flynn Levy is CEO & founder of Essentia Analytics. Prior to setting up Essentia, she spent 10 years as a fund manager, in both active equity (running over $1bn of pension funds for Deutsche Asset Management), and hedge (as founder and CIO of Avocet Capital Management, a specialist tech fund manager). I’m just going to say it up front: I loved Thinking in Bets by Annie Duke. I’ve read pretty much every book out there that relates behavioral bias to investing, but this one’s a gem. Yes, it’s about poker – but only sort of. It’s really about what top poker players do to continuously improve the quality of their decisions in the heat of the moment. It’s a great read, with lots of clear take-home advice about decision-making for non-poker players, including professional investors. With this is mind, I sat down with Annie for a quick chat about some of the similarities between playing a great hand and making a great trade. CFL: Annie, in your book, you make the point that “investing is poker, not chess”. Can you elaborate? AD: It was the game theorist John von Neumann who first made the distinction that chess is a form of computation, not a game. That’s because, in chess, there is always a right way forward at any point. Poker and, for that matter, investing, are different as they are each characterized by incomplete information and a significant element of luck. What’s more, valuable information is often hidden from the participants – something that’s not so much the case for chess where each player can see where the other’s pieces are. As a result, in both poker and investing, you can make the best possible decision at every turn – given what you know – but still lose the hand or the trade because of luck or information you didn’t have access to. CFL: You’re now retired from professional poker and spend much of your time working with traders as a performance coach. What similarities and differences do you find between them and poker players? 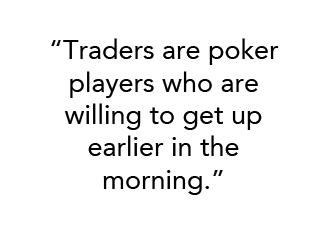 AD: Traders are poker players who are willing to get up earlier in the morning – other than that, they are pretty similar; they have similar mindsets and ways of thinking about probability. Both groups also often struggle to look in the mirror or move away from making decisions by gut. I often encounter traders who push back against the idea of a structured post-mortem process that will hold their intuition – often a large part of their actual decision-making process – up to the light. They want their analysts to do that sort of objective, data-centric exploration around the decision to trade, for sure, but they struggle with the idea of doing it themselves. For some traders, there’s also a fear that they will get less credit and be devalued in the eyes of others if they rely on something other than their gut when it comes to making decisions. CFL: I see that amongst some fund managers, too. It reminds me so much of the concepts in the book New Power: It’s that old-school model where power is hoarded by the individual vs the dynamic we’re increasingly experiencing today, thanks to social media, where power lies with the many and is channeled toward one end or another. There are a lot of people in the investment management industry who aren’t ready to accept that the “old power” way, where fees are opaque and PMs are “stars” who don’t actually have to prove their skills on an ongoing basis, is dying. That doesn’t mean that active fund managers are going to disappear – just that the ones who succeed will have embraced the technology that makes success possible, in this new world. CFL: I think this goes back to your point about “investing being poker, not chess”. There’s too much uncertainty and hidden information in the market for it to be inevitable that algorithms totally replace human judgement in investment decision-making. AD: Exactly. What algorithms are very bad at is novelty. They are really good at interpolation: if you feed them a ton of data about, say, animal attributes, they can then figure out what a cat is. But they’re not good at novelty: if you give them a picture of a blue cat, or put a cat in a weird environment, like outer space, a human knows it’s a cat, but an algorithm struggles. And they’re really not good at generalization: a great example that I saw recently is that you can teach an algorithm what a cat is, and you can teach it what a mountain lion is, but if I told you that an ocelot is halfway between a cat and a mountain lion, a human would say “ok, I understand”, whereas an algorithm wouldn’t know what to do. And we know that not a lot of progress has been made on these issues. So, I’m both a huge skeptic and a huge optimist when it comes to algorithms; if people rely too heavily on them, I think they will lose. But if you can develop the right model of machine learning and human intelligence working together, I’m much more positive about the possible outcomes. CFL: I think we’re agreed that a portfolio manager or trader who is willing to embrace technology, and who is willing to reflect objectively on what is working and not working about the investment process, has a competitive advantage. In your book, you talk about how being part of a “truth-seeking pod” (a group of people who are committed to helping each other examine the facts about a given hand of poker as objectively as possible) has given you an advantage in poker. Do your trader clients implement that idea? AD: They implement parts of it – pre-mortems, for example. Say you’re a long a stock – a pre-mortem asks you to imagine a year from now, when, let’s say, the that stock has lost 30% of its value. You’re then asked to examine what would have led to that state of affairs. Traders really see the value of this exercise because it helps them recognize how anchored we can all get in how we see the world today. That’s part of what a truth-seeking pod does. Another example is where I get people to commit to writing down the details that have to be shared in discussing any trade. Yesterday, a trader said to me “We don’t really need to do that because the people I work with tell me the relevant information at the time – if they don’t share a detail, it’s because it’s not important.” This is exactly the problem! People don’t usually fail to share information intentionally, but they are far more likely not to share all the important information if they are not using a deliberate framework like a checklist. CFL: Thanks so much for your time, Annie. I hope you’ll join us at Behavioral Alpha 2018 on November 9th in NYC, where your friend and poker player Maria Konnikova will be speaking – alongside the authors of New Power, that book I mentioned (purely by coincidence!) earlier. It’s going to be right up your street! Enjoy this post? 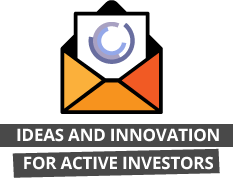 Subscribe to receive our insights into active management process & innovation.